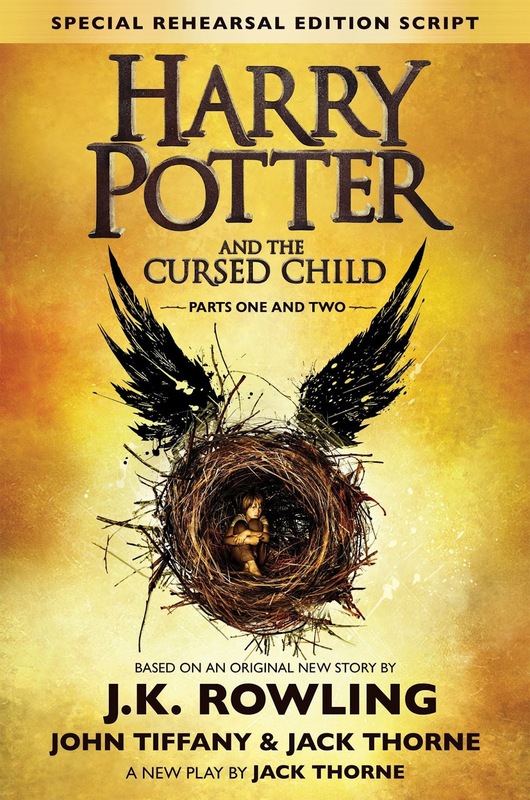 "It was always difficult being Harry Potter and it isn’t much easier now that he is an overworked employee of the Ministry of Magic, a husband and father of three school-age children.While Harry grapples with a past that refuses to stay where it belongs, his youngest son Albus must struggle with the weight of a family legacy he never wanted. As past and present fuse ominously, both father and son learn the uncomfortable truth: sometimes, darkness comes from unexpected places." Yes, I started out this post like I would any other review. But let's be honest, this is going to turn into a novel in and of itself. I have a lot to say about this book, not only as a trained and practiced children's librarian, but as a part of the Harry Potter generation—my seventeenth birthday being mere months before the release of the seventh book, which I devoured in one night. I will admit, however, that in my adulthood, I am not as devout as I once was, and have not spent much time over Rowling's periodic Pottermore updates. This all makes for a very interesting review. This is a perfectly fine example of script work for a play that I imagine is quite enjoyable and exciting. Without consideration of the franchise this play has tapped into, one can appreciate the writing and plot rather easily. The stage directions are fleshed out and make good use of the whole of the auditorium and audience experience. The story moves quickly and builds dramatically. I really admired Scorpius' character; he's great comic relief. There's a lot of humor, actually. And it touches on some tender aspects of family relationships. Really, on the surface, this is an admirable piece of work. But we're not here as a completely ignorant, surface reader, are we? No. In fact, it is with complete confidence and certainty that I say to you now: this is NOT book eight. This is not the eighth story. No. Don't put it in the Harry Potter series. Stop it right now. How dare you. It's not even in the same league. It's not even in the same format. Let's make some things clear first: Rowling did NOT write this book. This is a script drafted by Jack Thorne for a play directed by John Tiffany. Yes, the three did collaborate, but Thorne simply based his work on a story Rowling created. The writing itself is all Thorne. So, really, this is glorified fan fiction. Fan fiction made with the blessing of the original author. An article on Pottermore admits as much: "'I'd read all the books in my twenties and I'd go to the cinema and watch all the films by myself. I was deeply in love with Potter already, so the chance to do this...' says Jack, like he still can’t believe J.K. Rowling has given him characters from those books and films to write onto the stage." This is what bothered me the most while reading. Almost every other line that involved an original character resulted in a jarring thought along the lines of, "Harry would never act like that." "That's not something Ron would do." "Yeah, right, Draco." "Why is Ginny so completely devoid of what made us all love her in the first place??" It interrupted the reading experience and made the whole of the story uncomfortable. Okay, yeah sure, I'll allow for some disconnect between the play's characters and the originals because, yes, the script format of the book means that the reader is generally not privy to character's inner thoughts and emotions like in the novels. And yes, obviously they are twenty years older. It's in a different time and setting. I might even be able to deal with the inconsistencies if it were that simple. Okay, thank you for letting me vent. To put it simply, I wish they hadn't marketed it as "the eighth story." I wish it was simply a play. So how do I rate this? As a children's librarian, I laud that this will put a format of writing into kids' hands not often seen: a play script. I enjoyed the stage directions and imagining how it would all look (I even wish I could see the play!). Scorpius is awesome. The climax is exciting. It's really a fun book to read. But as a Harry Potter fan, the marketing and hype is insulting. By putting it into the original series, it necessarily draws comparisons to a set of books that this play simply cannot compare to. In the end, I recommend it. Don't rush to its pages, looking for a return of beloved characters in a magical world. Don't expect book eight. Just sit and enjoy the nostalgia. Appreciate the attempt. What was your reaction to the book? Do you agree or disagree with any of my sentiments (lengthy though they may be)? Comment below! Maybe J.K. will relent and turn the script into a novel and put her own natural twist on the plot. I enjoyed your thoughtful review. My sons are still in the midst of reading the series, so they didn't even want to look at this one yet. I'm not sure I could handle a reworking of book 4, but at the same time I'd like to see how this works as a play. 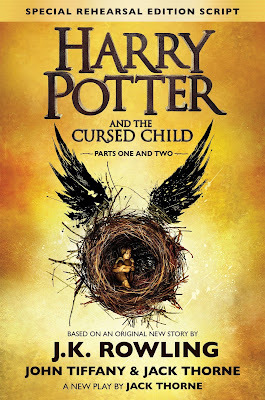 I agree with everything you said, but I did enjoy it and I think it is a great spinoff-just NOT the 8th HP book. I totally agree about glorified fan fiction and JKR not being the original source of this story. There were many odd/weird moments where I felt like the writer just thought, "wouldn't they like it if we did this?" "Oooooh let's do that" (AKA the trolley witch part, and more). A lot of things were forgivable, but the twist at the end...I just...can't. I may be the only person on the planet who has not read this series. If I ever get around to it, I will had this one. Thanks for your review.